Chock full of conglomerate fun, there are three primary climbing sections around the town of El Rito, NM. The El Rito Sport Area, the El Rito Traditional Area and Little River Wall a bit west of the town of El Rito. The climbing at all the areas is really fun with lots of great pockets and cobbles to pull on. The sport area contains well protected, cobblestone sport climbing with routes up to 5.13. If you have ever been to Maple Canyon in Utah, this place is very similar, but not quite as steep, and the area is not nearly as large. The "trad" area has less steep, moderate, two-pitch routes up to 200' tall and is a great area for the beginning traditional climber to learn his or her skills. The Drunk Wall is a seldom visited, small shady conglomerate area with only four routes. There is a little bit of potential for more rotues for the adventurous. An extensive online guidebook is also available for this for the sport and trad areas. - "Taos Rock Climbs & Boulders of Northern New Mexico" by Jay Foley, Sharp End Books, 2005. - "Rock Climbing: New Mexico" by Dennis Jackson, Falcon. The sport and trad El Rito climbing areas are just a few miles north of the small community of El Rito. The Little River Wall is a few miles west of the town of El Rito. To get to the El Rito sport and trad climbing areas travel north on FR 44 from El Rito. At the intersection for road 248 stay to the right (the sign for 248 was in the middle of the fork and unclear which road was 248 and which was FR 44). Continue on FR44, you will pass spur road 44A on the left. Park here for the sport area. To reach the trad area, go about .6 miles further on FR44 and you will come to an unmarked road on the left. This is the road to the trad area. Take this left and drive about a mile until you get to the gate mentioned in the guide book and park on the right (obvious parking area). High clearance is necessary, or walk the road where it starts to get bad (it will take less than 30 minutes). A cairned trail leads east toward the trad cliff. For directions to the Little River Wall, see the main Little River Wall area page. It is imperative climbers pack out their used toilet paper. The sport climbing area is very concentrated. The steep, loose slopes make it more difficult to find a place to use the bathroom resulting in some very popular "poop spots." Unfortunately. there is a large amount of used toilet paper floating around these popular spots. This is gross and disrespectful to the area and other climbers. 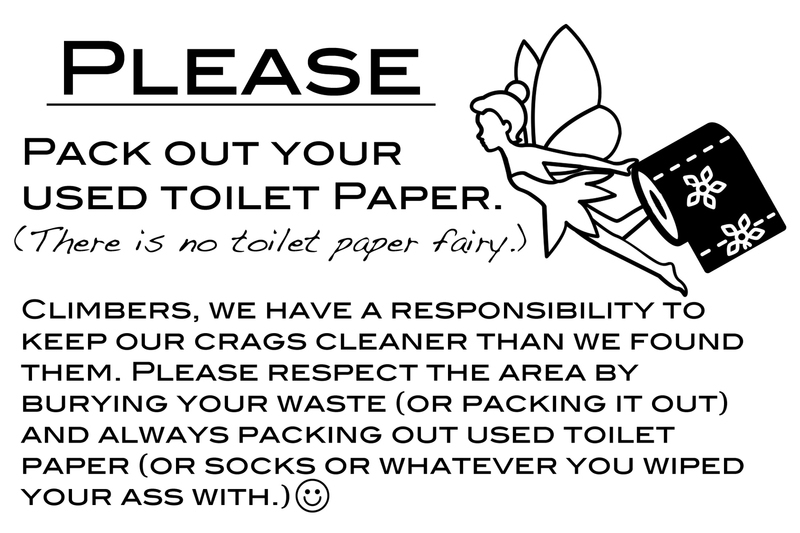 Do your part--put your used toilet paper (and poop for bonus points) in a baggie and take it home for disposal. Also, always pack out what trash you brought in. Bonus karma points for picking up trash left by disrespectful others. Patric Climbing at El Rito (route unknown). Hard to say, this time of year. I haven't been out this winter. I've climbed there in November before, but it was pretty cold. Most of the good cliffs face west, but the Super Slab & the Schoolhouse Slab face South, so they would be ok if its sunny. I did not find Jay Foley's Taos Rock guidebook to be helpful while climbing in the Taos area and feel that better, more detailed directions and route descriptions can be found online rather than in that book, both at naclassics.com and here on mountainproject. Perhaps the Foley book could be a supplement if you really wanted to buy it. I was frustrated with Foleys Taos book mostly because the directions to every area we went to were vague at best and left a lot of room for interpretation in how to get there. We had to ask for help several times. For future editions, it would be helpful to note that the directions seemed like they were written for locals only, who were already familiar with all the unmarked dirt roads and country highways rather than out-of-towners. Same goes for the route information, if there even was any. I guess its best summed up in the El Rito chapter when it says for detailed route descriptions visit Gary Clarks website atnaclassics.com/elrito. I'm confused why I should visit a free website rather than consult the guidebook I purchased for route information. All the locals we ran into sympathetically laughed when they saw us using the Sharp End book and one of them was gracious enough to let me keep the print out from Clarks website  thanks Mark! Welcome to MP and thanks for your opinion (even though it came off a touch harsh when I first read it) but I think my point is still valid. Given 'Taos Rock' is in the first edition, I agree it could be improved on. When it came out a few years back (2005) it was, and I would argue still is, the most complete book on the subject for this area and a real gift to our climbing community. I think Dennis Jackson's statewide book is also done well (with some limits by scope he would probably admit) but Jay's book tried to make available every route in the county. Jay, Bob D'Antonio, Joel Tinl, Dennis and a few others have since tripled the total number of pitches in the county and some of that is listed here. I agree on the difficulty of finding one's way around NM, I still get lost, but I have checked the directions and I think they are pretty sound. As for the route descriptions, aren't they all shown as photos? I, for one, have been impressed by the effort these guys have put in. Ron Kleinsmith wrote: Does anyone know if they are still having "theft/ break-in problems @ El Rito? BE AWARE OF THE LOCALS! My trip to El Rito ended with an indirect direct threat by one rancher and a confrontation with another one about a calf. As my friend and I were leaving, we pulled off the side of the road to allow a truck and trailer coming the other way pass. As we were pinned down, the rancher took the liberty to inform us that we need to make sure to keep our speed under control (even though I felt like I was not speeding) and that I need to tell all my friends, that means you guys. He ended this condescending speech with if something happens, like you hit a cow or a person, you are going to be in a lot of trouble, not just with the law. I got the feeling that he was not necessarily irate at me specifically, but that the people of El Rito do not like foreigners in their area, especially if we are driving more than 5 MPH. The second incident happen a couple miles down the road where there was a calf on the side of the road and I was trying to pass it. I thought I was not being threatening to the cow and I was just trying to pass it, but apparently a second rancher thought differently. He rode up on his horse, with lasso and all, and yelled at me for chasing the young cow. I thought I was driving appropriately around the cow, but I guess not. The local thing is for real. I have a friend who had a long conversation with a local ranger, who said that they've had problems where local hoodlums flag down cars along the road as if they need roadside assistance, then rob people with weapons. The ranger was very clear about recommending NOT stopping, but simply blasting on through as quickly as possible. I'm not a gun person, but if I were a gun person, I would bring my gun to El Rito. As Lee mentioned (in the sport climbing section), best to try not to drive in or out after dark on Fri/Sat nights, as the local riff-raff are often out partying at that time (which often includes alcohol and shootin'). Seems that the incidents occur near the start of the road into the sport area. Haven't you noticed the dumped tires and shot-up bottles and other trash in the little pull-outs just after the dirt road takes off from the end of town? Your posse is not very likely to get into trouble, as you get up there mid-morning and come out well before dark. Out of state plates? C'mon, bro, Santa Fe and Albuquerque are plenty enough "not from here" to get those punks riled up. I second Dave's recommendation of the El Faralito restaurant! The staff were very accommodating and friendly, even though it was obvious we were not locals. I did see the trash at the head end of the dirt road though, it was a bit sad. Once you pass the Sign though i is clean as a whistle. Locals update....I grew up in northern NM, and I've never met sketchier people in my whole life, myself included. Low riders, heroin, drinkin' in arroyos and shootin' the guns...I'm starting to get homesick just thinking about it. Thank you J.Halladay for the online guide! It was helpful and I loved the climbing! Excellent climbing area; no problems with the locals as others have mentioned, although I've only been there once so far. One thing to note: THERE ARE MULTIPLE "EL RITO"S IN NEW MEXICO. This is REALLY interesting. I drove up there with my aging geologist Dad today (8/18/13) and my wife and daughters and my mother. Dad has a PhD in geology (University of Tasmania, 1953 or so) so he's always stoked to look at rock. It was surprising to see all the route development there. I'd climbed at the "traditional area," of course, with the LA Mountaineers in 1982----who hadn't? Paul Fehlau and I later (1989) went up to the cobbled cliffs (the so-called "Sport Area") and top-roped a bunch of climbs (all of the the Super Slab routes) that year. Ha! It's such a great place to climb. Funny to read the official "history." Who friggin' cares? It's cragging. Claire23 wrote: Are there any bathrooms or water available at the sport climbing area or at the camping along the road? Pit toilets or running water? DLach wrote: My friend and I plan on doing some camping and climbing here over spring break. I do have some concerns though. Is it dangerous to camp near the climbing areas? Are the locals and break-ins really that bad? Thank you for any advice you can offer. On May 21, 2009, Jason Halladay wrote: I've been going to El Rito sport and trad areas for years including overnight camping and never had a problem personally or known anyone that has had a problem. In my opinion the theft issue is over-hyped. Love this place! Only tried the trad area, on a limited amount of time...one day...so not knowing how the ratings would match up...started easy with a 5.5. Felt real fun and easy. Then to a 5.6+...still easy, but loads of fun! Ilise Merritt wrote: Heading to El Rito for Memorial weekend. Will it be okay to leave our camp setup behind while we go climb (tents, sleeping bag, dry box...)? Or is it better to pack everything up again? Almost stepped on a rattlesnake in the boulder field below the trad area. Keep alert and use a long stick to poke around in front of you on cold mornings when snakes come out to bask in the sun to warm up. Stich wrote: If you look from the sport camp area, you can see cliffs to the left that look clean and tall. It doesn't seem to be in the guide, however. Might that be some "secret" area? Heh. I'm sure there is more to develop. We're so lucky to have an area like this. It's like a climbing gym outside. Tons of routes in a "relatively" small area. Huge range of difficulties, styles and heights. Because this is such a popular area, please be mindful of the condition of the top anchors. Top roping through the *permanent* hardware looks to be really common practice. I have found some pretty sketchy stuff at the top of climbs. If you look from the sport camp area, you can see cliffs to the left that look clean and tall. It doesn't seem to be in the guide, however. Might that be some "secret" area? Heh. I'm sure there is more to develop. - There is a large cliff band north of the sport area that could yield some long, easy/moderate routes if one was so inclined. I'm not talking about the cliff immediately to the north, which is really just a continuation of the formations that make up the sport area, but a completely separated band of cliffs further north and a little higher up the mountain side. It's more or less straight east of the trad wall. Approach by hiking straight up the hillside from the road a little ways north of the sport area parking spot., maybe about halfway to the turn off to the trad area. The rock, especially on the south end of this cliffband, appears quite good in spots, but low angle. There are some steeper alcoves/roofs but these steeper sections tend to slab out quickly. The wall is +100' in spots. Liana Son on March 5, 2018 wrote: Hi there. We are trying to go to El Rito in a week. Forest service is saying that Forest Road 44 is closed? Does anybody have any beta about the access at this time of year? Thanks.